Perhaps during Christmas, more than any other time, we fail to hear God's voice. Distractions abound, and at a time when our focus should be on our blessings and our Saviour, we're tuned in to other things that seem more pressing. But on Christmas Day, make the choice to open your heart, mind, and spirit and listen for God's voice. A very happy, peaceful and blessed Christmas to you all. The Crib Service is a lovely family-friendly event. 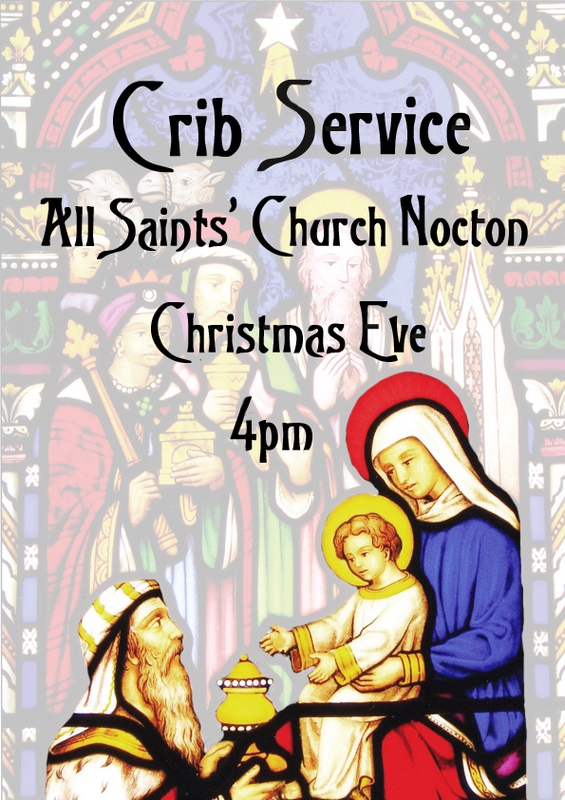 Please be aware that this year's Midnight Mass is at Potterhanworth at 11.30 pm; we will be having a Family Eucharist at Nocton at 10 am on Christmas Day. A huge thank you to everyone who turned up to sing carols at The Cottage care home and round Nocton Park on Wednesday evening, and to those who generously donated - we raised a fantastic £130 to be shared between All Saints' Church and the Nomad Trust. We really appreciated those who stood in their doorways in the cold to listen to us and especially the hot sausage rolls at one house - you know who you are! And finally thanks to Nocton Parish Council for providing the mulled wine and mince pies at the end, and to Janet & Ian Goldsworthy for their hospitality. Since August 2014 the bell ringers at All Saints Nocton have been ringing Quarter Peals (a piece of continuous ringing lasting approx 45 mins) on the Church bells to commemorate the centenary’s of the deaths of the 13 Nocton residents who were killed in the Great War. The bells are half muffled for these quarter peal by attaching a leather pad to one side of the clapper resulting in a mournful sound by creating an echo effect. So far they have commemorated 9 of the Nocton residents. The next Nocton resident to be commemorated is Corporal GEORGE LEARY who served in the Lincolnshire Regiment before being transferred to the 477th Agricultural Company of the Labour Corps and died from his wounds on 15th December 1917 aged 41. 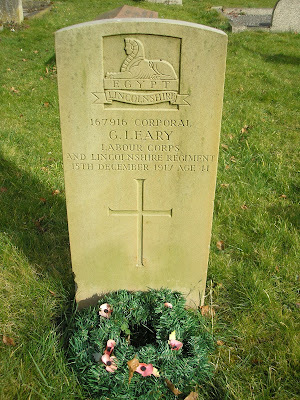 He was the son of Mrs Jane Leary of South Carlton Fen Lincoln. He was obviously either born in Nocton making him a Nocton Native and they moved to South Carlton or he was born at South Carlton and they moved to live in Nocton, which explains why he is buried at Nocton and included on the Nocton War Memorial. George was the tenth Nocton resident to be killed in the Great War. He is buried just inside All Saints Churchyard on the left by the Churchgate and is also commemorated on the War Memorial on the back wall of the Church. If you hear the bells ringing half muffled around 15th December please stop and pause for a moment and think about the sacrifice which was made 100 years ago by this brave Nocton gentleman.